Express has become iconic of the dynamism and innovation of the Soviet 1930s. Steam and cloudy skies envelop the train's dark skeleton. Speeding down the tracks, the train resembles a zeppelin preparing to launch. The train was named the "Red Arrow" and ran between Moscow and Saint Petersburg (then Leningrad). A triumph of Soviet industrial technology, only two Red Arrow trains were ever built. Along with the Soviet metro and developments in aviation, the engine captured in Express is emblematic of 1930s Soviet industrial design. Taken in 1924, this portrait of Russian Revolutionary poet Vladimir Mayakovsky is one of Alexander Rodchenko's earliest photographs. 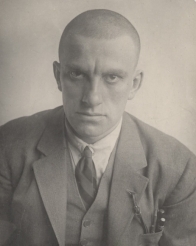 Outside of his role as poet, Mayakovsky was a screenwriter, film actor, artist and editor for the Constructivist journal New Left Front of Arts (1927-1929). Rodchenko and Mayakovsky would collaborate on various projects through the 1920s including Pro Eto (1923), an illustrated epic poem dedicated to Mayakovsky's lover, Lily Brik, and posters for the state advertising agency, Mosselprom. In 1924, anticipating further collaborations with Mayakovsky, [Rodchenko] made a group of posed studio portraits of the poet. 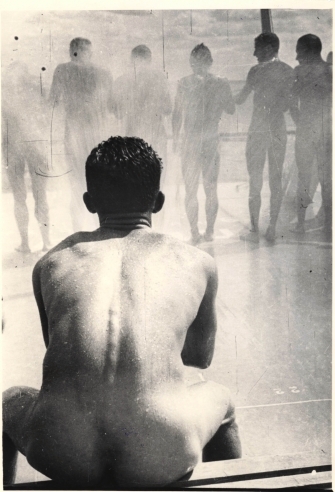 This in turn led to an open-ended series of portraits of family and friends, through which Rodchenko began to explore photography as a descriptive medium. This exploration included the brilliant concision of the portrait of his mother, tightly cropped from the more generous framing of the negative, and a handful of multiple exposures. Both the cropping and the double exposure signal the graphic designer's approach to the photograph as an invitation to alteration. Portrait of Mother was published in Sovetskoe Foto's 1927 issue no. 10. This photograph is a timeless celebration of the joy and energy of youth. The artist positioned his subjects in a triangle composition that succesfully corresponds to the rounded shape of the camera lens, and the interaction of light and shadow give the photograph a warm vitality. A trio of Armenian athletes stand before a 1935 sports parade in Moscow's Red Square. The photograph's impeccable geometric composition is evidence of Petrusov's meticulous planning. The interlinked pattern created by the figures' backs conveys the fraternity and unbreakable bond between the athletes. Petrusov also structured his photograph as a cinematic shot, creating a deep perspective: focusing on the trio in the foreground and illuminating the performance space with shadowy silhouettes of dancers in the distance. A rare vintage print, Armenian Delegation reveals the warmth and texture of distinctly early 20th century paper — visible in the canvas of the athlete's shoes and the rough cobblestone they stand on. Two workers construct the revolving glass globe that decorated the facade of Moscow's Central Telegraph Building. The Globe both documents the rapid technological developments in 1920s Moscow, and conveys an impactful message about the Soviet Union's new global position. As a key member of the Soviet 20s avant-garde, Shaikhet captured the photograph with a Constructivist eye — as evident in the tight framing and sharp contrasts of light and dark to celebrate industrial form. The artist and designer El Lissitzky incorporated this photograph into his 1930 photocollage for the International Hygiene Exhibition, Dresden, in which the globe is superimposed onto the body of a factory worker. 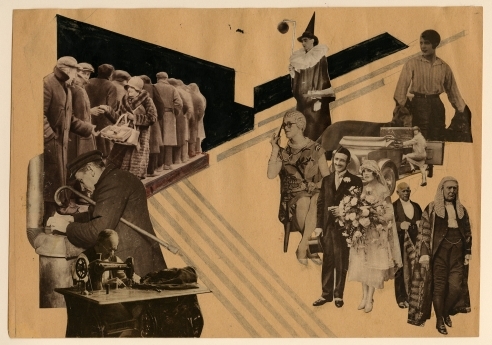 Galadzhev created this photomontage at the height of the New Economic Policy (NEP) that briefly introduced small-scale capitalism to the Soviet Union. In juxtaposing images of a clown dressed in an aristocrat's tuxedo, with a fashionable new automobile, Galadzhev responds to NEP and the upper middle class culture that emerged from it. 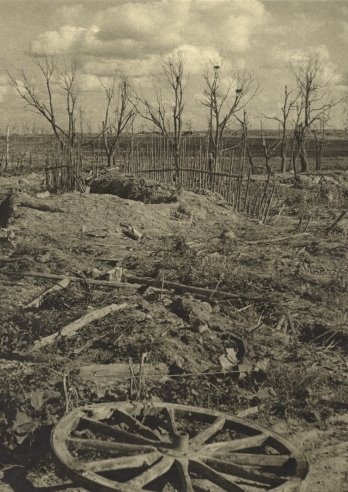 Galadzhev may have produced the photomontage as part of his artistic training at the State College of Cinematography, where he studied from 1921-1925. This photomontage celebrates the first aerial shots of Moscow by prominent Soviet cinematographer, Boris Frantsisson (1899-1960). Part of the milieu of Soviet Constructivist film makers and photographers, Frantsisson collaborated with the director Dziga Vertov and contributed to films like Girl with a Hatbox (1927), and The Happy Canary (1929). Galadzhev has inscribed the words “Frantsi-" and "sson” on the collage, perhaps intended as a pun on the Russian word “son,” meaning to dream. Galadzhev’s wordplay reflects the ideals of flight and technology that captivated members of Moscow’s bourgeoning film scene in the 1920s. With a mock gesture of His Majesty waving his hand, [Eisenstein] ordered photographs to be taken of himself in his role of iconoclastic emperor of a new art form. But as he sat on the throne, his short legs did not touch the floor. Defiantly, he flung his legs over the arms of the throne and was photographed again. Petrusov reveals a bright sense of humor and a lively spirit of experimentaiton through his caricatures of prominent Soviet photographers like Aleksandr Rodchenko, Boris Kudoyarov and Dmitry Debabov. 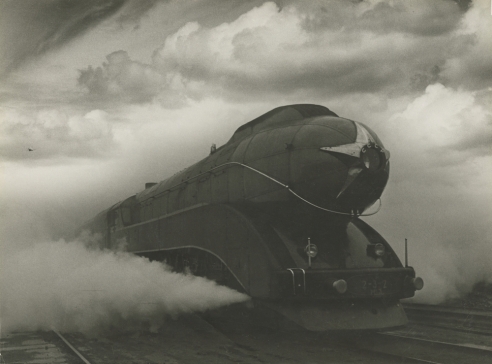 Petrusov submitted these photographs to the seminal 1935 exhibition Masters of Soviet Photography in Moscow. 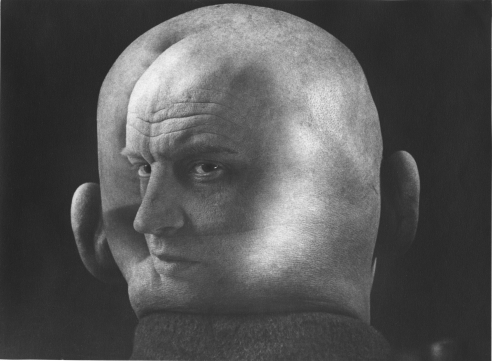 Petrusov experimented with darkroom processes to produce this caricature of fellow artist, Boris Kudoyarov. He produced the distorted bulge in Kudoyarov's jaw by carefully bending the photographic paper while exposing the photograph. The bend in the paper is visible along the lighter points on the bottom of the photograph. Ignatovich creates a symmetry between the colt's black body and that of the white mare behind. The classicized aesthetic of motherhood is represented by animals and people alike. Petrusov captured this photograph as part of a photoshoot on collective farming for the internationally-published journal USSR in Construction, 1936, no. 3. This is one of the strongest works of Soviet art photography because it simultaneously reveals one aspect of the newly developing daily life on the collective farm in a documentary fashion: the joy of collective labor is depicted with enormous expressiveness. The group of collective farmers gather for a comradely lunch, as if celebrating a holiday. In the background — the lovingly worked socialist fields. Worker and Kolkhoz Woman centers around Vera Mukhina's (1889-1953) eponymous statue of two figures holding a hammer and sickle. Mukhin created the statue for the 1937 World's Fair in Paris. A glorification of Soviet power, the 80 foot-tall statue was displayed immediately before the Nazi German pavilion and later relocated to the VDNKh Park in Moscow.